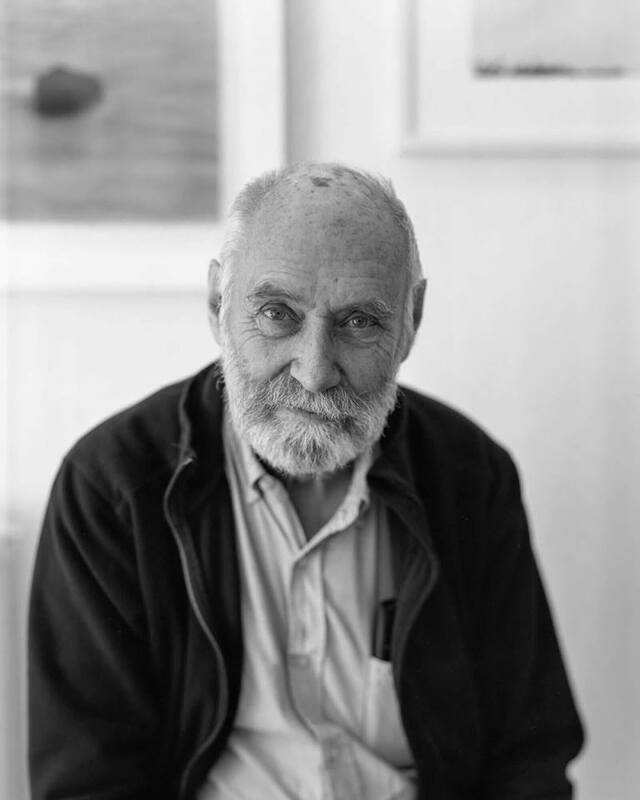 Gerry Johansson is a photographer based in Sweden. BA: How often do you go out to make photos? GJ: The last book American Winter was done during three week periods during 2017 and 2018. The rest of the years have been spent on smaller ”projects” (sorry, but I hate that word). They usually last for a week or so but I also have some ongoing work that has been running for years. When I return from travels, much more time than the actual shooting is spent on developing, scanning, printing and editing. I’m analog, except for work in preparation for printing. All my books the last 20 years are scanned by me. In all kinds of manner. I went to Ulan Bator because I remembered a film scene in a movie by filmmaker Chris Marker. I went to Pontiac, Michigan, because I heard over the radio that it was the first American town to go bankrupt. The Deutschland book was done because my childhood had many German influences and I wanted to learn more about the country. When I start working on a subject I try not to have any predetermined idea of what I will do. The work has to develop as I go along. It usually ends up looking pretty much the same anyway. Thankfully. How much time do you typically spend with a scene? That is very different. But I usually doesn’t spend much time in any place. I prefer to work in the countryside, in the small towns, and in an hour you have seen pretty much what there is to see. I rarely wait out a scene for better light or so. I like to work quickly as I go along. There will always be interesting things to photograph. Do you automatically visualize in black/white? I guess so. In earlier days I would also bring a camera for color work. But nowadays I find that too distracting. I seldom think that something I photograph would look better in color. 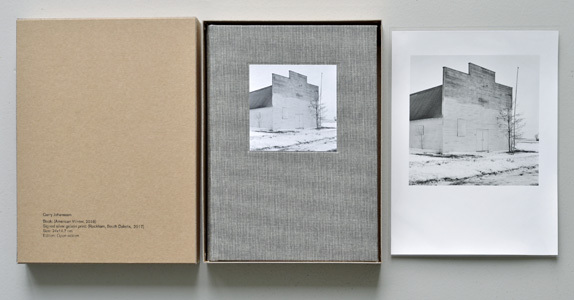 However my favorit photographer today is Guido Guidi whose work I rate way above Eggleston and Stepen Shore. 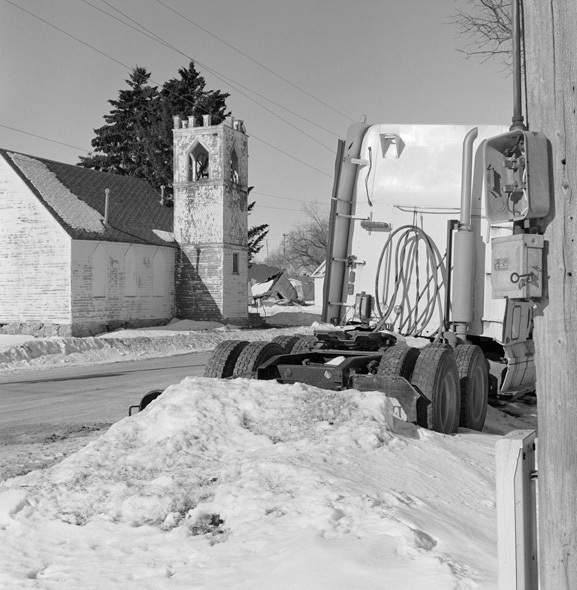 Why did you choose to shoot winter scenes for your recent book? I suppose I’m a winter photographer. I even went to Antarctica, and that was a great pleasure. I hardly ever photograph in summertime. One source of inspiration came from the movie Fargo, by the Coen brothers. There are some fantastic scenes of snowdrift over endless highways. But film is one thing and still photos are something different. But it was certainly a great experience driving there, even though I didn’t manage to make a great picture of it. I know American landscape photography quite well and I found that most of the pictures were made in pleasant, sunny weather. Not a big surprise but I felt something was missing. How did you decide which states to visit? I had many years ago been in Montana, Nebraska, South and North Dakota and Wyoming and I liked the vastness, emptiness and peacefulness. It’s a bit like being alone in an ocean of land. In an interview you once said "pictures can be different depending on their size and the viewing distance," a statement I agree with. The photos in your books are generally quite small, and the viewing distance is relatively close. What effect do you think that has on your photos? I like the idea that you are alone with the picture when you look at it. In an exhibition it is important that you have to walk close up to the image. Print size in exhibitions is 16 x 16,5 cm. I hate exhibitions where you can stand in the middle of the room and think you have seen the whole exhibition. In the book it is a bit different, but all the white space around the image creates a calm space for the ”reading”. The image size in the books is 9 x 9,2 cm which is close to the format you would have in an old family album. I think it has forced me to be more precise and careful with the structure and composition of the picture. But. strangely, on the other hand many of my pictures look awful if I make a big print. They sort of fall apart. Your website has note that you've recently eliminated limited editions. All print editions are now open ended. Can you elaborate on your reasons for this step? I think the whole idea of limited editions is silly and I’m surprised buyers don’t see through this business idea. Today you can buy anything in limited editions. Cars, toasters, or whatever. It’s stupid. Regarding my last books as Special Edition with open edition prints I have not heard one negative complaint and they are selling better than ever. My favorite argument is the fact that the Ansel Adams image Moonrise Hernandez, at a Sotheby’s auction in 2017 sold for $740,000. At the time it was printed in over 1300 copies. What has been the reaction from collectors? At times I have made editions just to please a gallery, but my sales are quite irregular so it just becomes too complicated. There are galleries that are OK with open editions so I stick to them. They are the nice guys anyway and people who buy stuff for the numbers on the back can go somewhere else. Another quote from a past interview: "Digital today looks fine, but everything is possible and the result usually comes out boring." Can you elaborate more on that thought? Do you think a limitation of possibilities can be positive in some way? 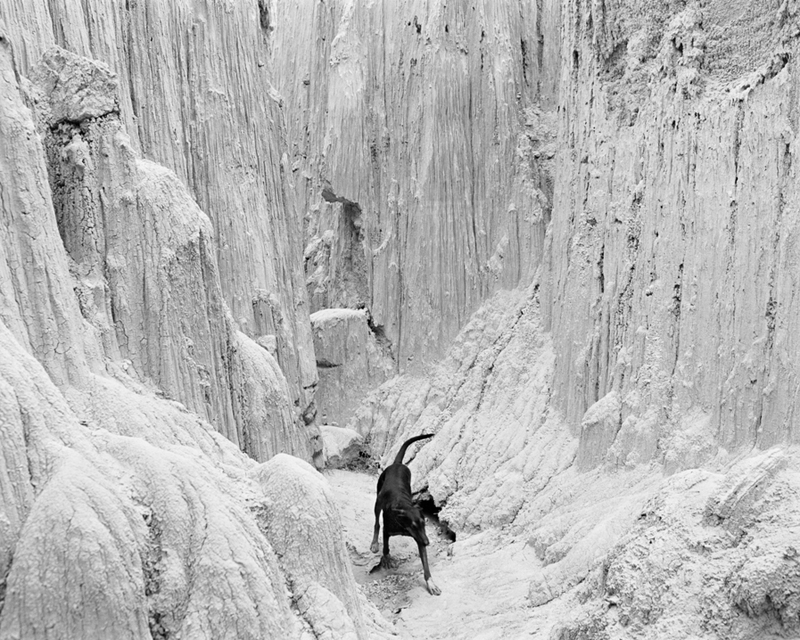 I just think that a properly made black/white silver gelatin print is something astoundingly beautiful. Film and silver prints are materials you have to work along with. They are materials with characteristics you have to understand and follow. In a similar way that a sculptor chooses wood, bronze or marble. So yes, I want some resistance when I work. There are of course fine digital prints also. But the result of the digital technique often puts a ”haze” of boring perfection over the prints. With digital material everything is possible so if that is your most important goal it is perfect. You've said that photo titles are important, and sometimes you announce the titles aloud when presenting work. And several of your books are sequenced alphabetically by title. Since most of your photos are titled simply with name of location, a trait which is somewhat uncontrollable, what is their importance to you? Yes, titles are important to me. They are usually very simple. Just the name of the town or the name of the street where I was standing, not the street I’m depicting. It’s a way of verifying where the picture was made. It is for instance quite easy to find most of the images from Pontiac on Google Earth. Quite often there is a connection between the title and the image content. If you don’t feel to silly about it, I recommend that you read out loud the titles for yourself. You will enjoy it. At one literary evening in Stockholm I showed images from Deutschland and read out the titles. It was enormously popular. Can you list a few of your primary photographic influences? First of all I would put Paul Strand. I saw his Blind Woman as a teenager and admired his work, but then he was ”lost” for me during many years. Actually after seeing Time in New England which I didn’t like at all at that time. But he has gradually come back to me. Since a few years back I have his ”Mexican Portfolio”, 20 photogravures, framed on the wall in my studio. It’s the first thing I see in the morning and the last thing I see when I go to bed. It’s fantastic. Other photographers I have admired and learned a lot from are Evans, Friedländer, Winogrand, Gossage and Robert Adams. I think the period in the late 60s and 70s is the golden age of photography. 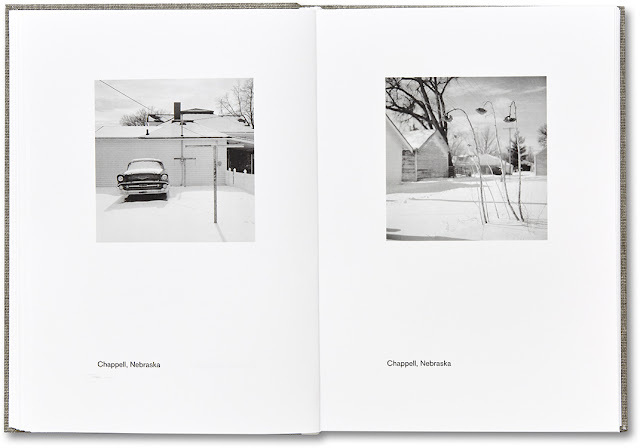 But let’s not forget some Europeans, Chris Killip, Graham Smith and Michael Schmidt. And as I mentioned before I think Guido Guidi, whose work bring constant surprises, is outstanding. What is your understanding of chance or coincidence as it relates to photography? To me chance and coincidence is everything when I work. I work with am minimum of planning or preparation. Everything comes to me as I work. None of the pictures I have made could I have figured out in advance. What about as it relates to life in general? In private life I’m quite well organized and hate surprises. What do you think your photographs say about you as a person? Difficult to say but I have a feeling people find me more social than they expect when they just know me from my pictures. Mimi Plumb is a photographer based in Northern California, and the author of the recently published book Landfall. Dark Days and Landfall seem connected in both time and subject matter, and they're a bit mixed up in my mind. Can you tell me how they relate to each other? Back in the day when I made the photos I didn't have a title for the series, or at least one I can remember. When putting the work on the website, I chose the title Dark Days for my 1980s photographs. 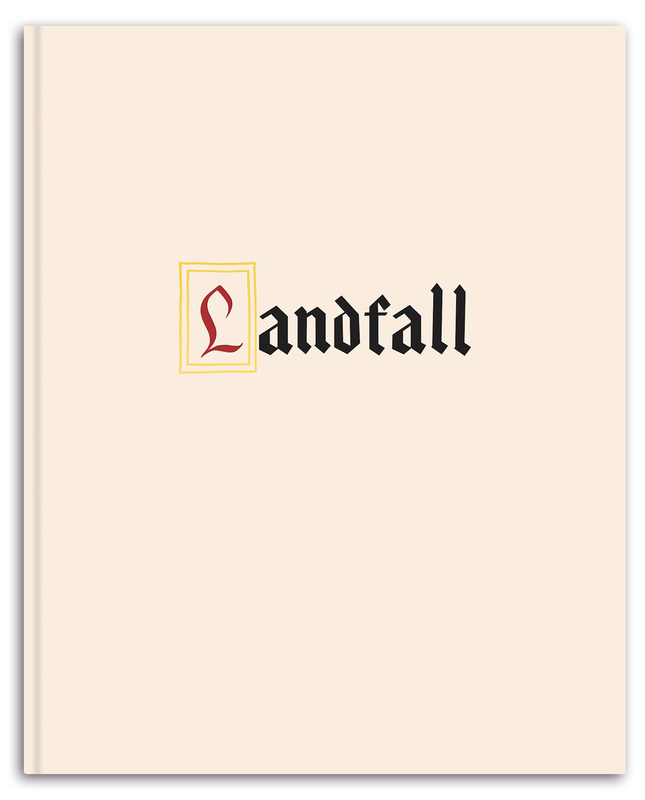 Landfall is the book made from my work from the 1980s Dark Days series. So they were all part of the same project initially? Yes, all from the same project including pictures from The City, also on my website. 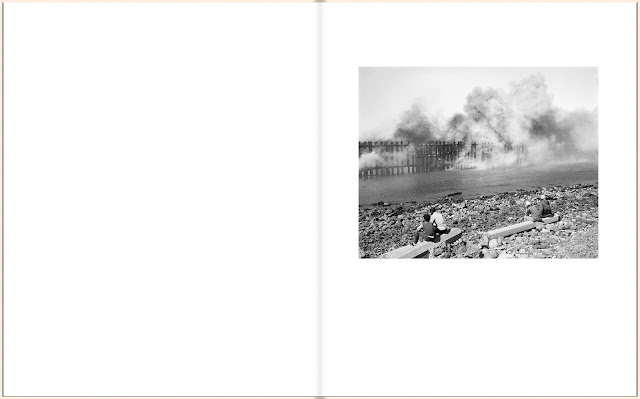 How did the specific photos for Landfall get edited into a book? The opening text does set a dark tone for the photos. But I think they also manage to remain open to interpretation. Not just photos of End Times or Reaganism or whatever. I think I felt a profound dread in the 1980s, a sense of no future, and I looked for subjects to express that. What was your process making the photos? Did you shoot specific places/times/subjects? What were the daily mechanics? Were you shooting any happy photos too at the time? Probably not happy but I do often like to find a bit of humor in a scene. When did the dread set in? Was it tied to some political event, or maybe to life events? There was a lot of optimism in the 60s that we could change the world. I think that optimism was challenged quite a bit in the 70s and by the 1980s, with the election of Ronald Reagan, a former movie actor to the presidency, I felt extremely disillusioned. It was in the air, in the music, if you think about the punk movement and what that represented. There was a recognition in the early 80s of global warming which was very worrisome. It didn't seem as if our capitalist system could meet the challenge of it. So the 80s were a letdown coming on the heels of such an idealistic period. Makes sense. Looking around at the American political scene now, do you feel the same sense of dread? There are two things happening now that provide some optimism. It's the anger of both young people, the Parkland students for instance, and the anger of women, and their refusal to remain silent. But the times I think are also much scarier, given the current state of our politics and the extreme rightward bent of Trump and the Republican party. I agree, scary times. But instead of dread it sounds like you're more upbeat? I just have a sense of something new happening, of many people refusing to accept where the country is heading, and willing to fight against it. Well, I felt that in the 80s too, with the punk movement you mentioned, and a lot of radicalism generally. But none of it seems to have had much lasting effect. Is the book's release timed with current politics in mind? The book's release happens to coincide with these times. It certainly makes the work more relevant to today. How did TBW get involved with the book? Very serendipitous... Paul Schiek from TBW saw a few of my vintage prints being framed at a local frame shop. He liked them a lot and eventually, a few years later, we met at a book symposium where he was speaking. The next day he contacted me about doing a book! We started on it about a year and half ago. Did it turn out roughly as you expected a year and a half ago? Or were there some surprises? Lots of surprises. They had seen a draft Blurb book I'd done along the way and I thought it would look like that, similar to Dark Days on my website. They had their own ideas though that clearly developed over time. 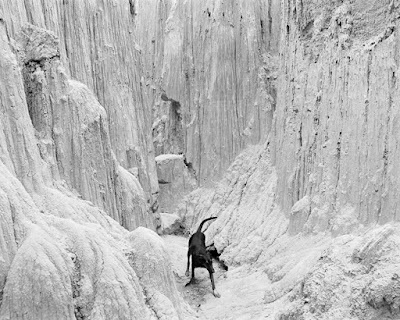 The sense I had from them —and it might be worth asking them about this— is that they loved many of the images and found them to be strong, but they were having a difficult time finding a narrative form for the work. The images in Dark Days are disparate and it's hard to find a cohesive grouping for the pictures. At some point they presented me with this edit and I quite liked it. I asked them to add some images that were important to me which they did. They then worked on refining it all. What do you think of their edit? For me it seems they chose the not-so-depressing photos from Dark Days, the photos from the series less loaded with decay and ruin? How did they choose the title Landfall? It fit the content, and it seemed to work for all of us. Since we're now in another political period of reactionary craziness, I'm wondering if you know of other photographers working today or projects or books which carry that same sense of dread, or are reacting somehow to our dark times? One which comes to mind is Alec Soth's Last Days of W but that was a decade ago. I wonder if there are ones you like which are more recent. There seems to be a pictorialist quality to a lot of work being shown today. Maybe it's what the collectors are looking for... not sure. What do you mean by "pictorialist quality"? I think Pictorialism is an emphasis on decoration and beauty rather than content and reality. There are a lot of decorative pictures out there in the art world. I think those are basically a given in any time period. Well you could trace it all the way back to the original pictorialists, Coburn, Brigman, etc, and then up through the modernists Weston, White, Adams, Sommer, etc. Their photos were generally non-political. Maybe you could even use the word decorative. Can I ask about a specific photo? 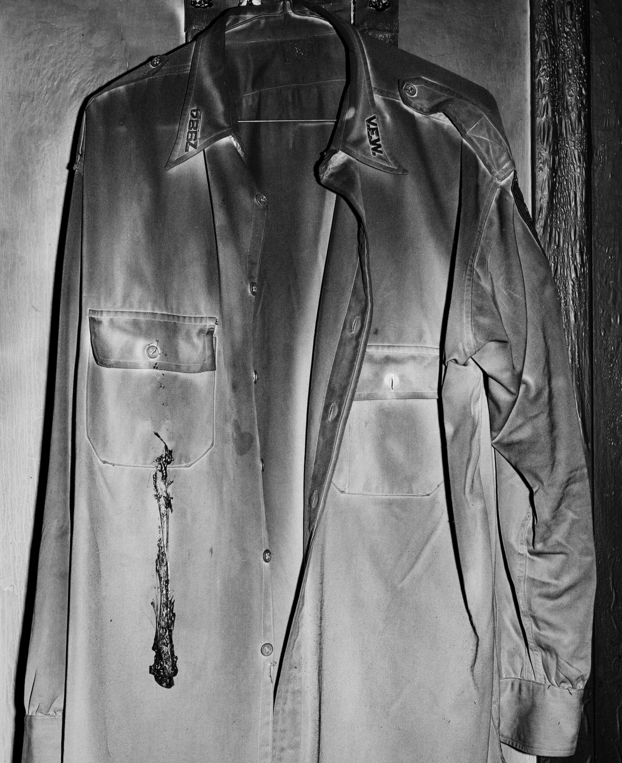 There's an image of a button up shirt in Dark Days. I believe it's been inverted so that the shadows are white. As far as I can tell it's the only photo with that treatment. What's the story there? Interesting! Nope, it's the fire. It has that effect. Oh, It's burnt! I totally misread it. I'd never invert a picture. I'm a purist. What I love about photography is its veracity. You can argue that it's not reality but for me it is. Often when people start fabricating or obviously manipulating the medium, I become pretty disinterested. You lost me on indexicality! And we are venturing into the grad school weeds. But seriously I'm interested in work that reflects the world around me, and most often when there's a lot of obvious manipulation the work loses it power for me. I kind of adhere to that adage that "truth is stranger than fiction." What about the decision to translate reality into monochrome? Is that a manipulation? I'm laughing now! Shall we go on? I thought we might end up at the abstraction of black and white. Photography, in its detail, even in black and white, I think can have a certain veracity that's undeniable, that speaks of life outside of one's fictions or manipulations of reality. True. I'm a purist at heart too. But I like creating thought experiments. I suppose that's a draw for most people into photography, the connection to "truth" and also the inherent dissonance. Here's an unrelated question. I know you recently retired from teaching, and your photo career has had a little boost since then, I'm guessing because you have more time now to devote to it. Were you basically chomping at the bit during all those years? Anxious to have more time to devote to your personal work? And now that you have more time, what else is on the docket? When I left teaching I had two ideas. 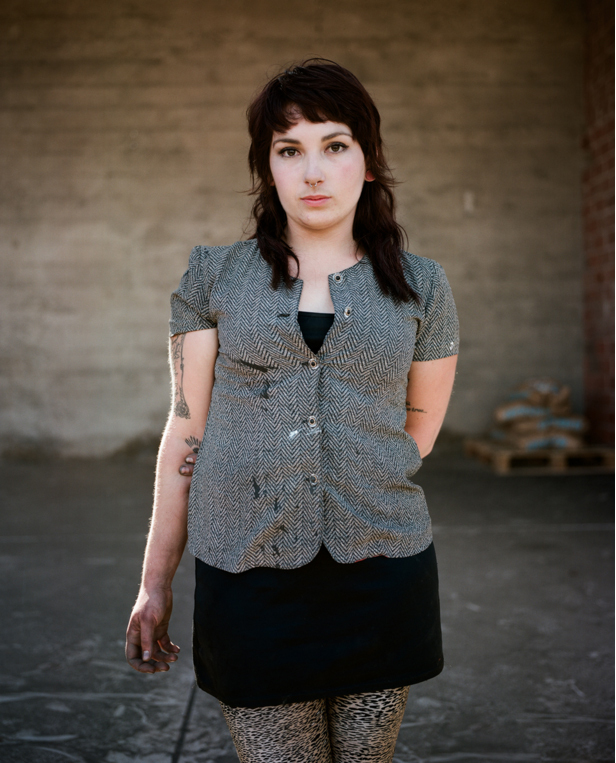 One was to concentrate on photographing women and girls, a subject always on the periphery of my projects. The other was to take a closer look at the the many projects I had done over the years. I had no idea that something would come of my old projects. 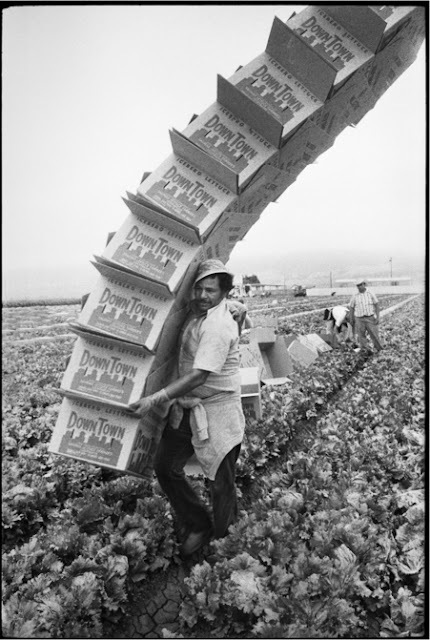 For instance, as I began scanning the farmworker pictures, I was quite shocked at how much work there was, and also the quality of the images. The pictures told a story of the farmworkers rather than of the leadership of the farmworkers, and people were interested in that depiction. What I found, to my surprise, was a huge amount of interest in my earlier projects. The Internet certainly made my work accessible to anyone looking. My suburbia pictures took on a life of their own, and seemed to touch a lot of suburban kids. Personally I was most interested in putting out my 80s pictures. It's difficult work though. The strength of it seems to be that there is a certain relevance today to the work I did back then, which is deeply meaningful to me. When you revisited the work after many years, what surprises did you find there? Something that comes to mind is my excitement in finding numerous iconic images I’d never printed or noticed before. Some examples are the ‘girl brushing her hair’ in Landfall, the ‘couple at the Standard gas station’ in What is Remembered, and the farmworker carrying ‘downtown boxes’ in Pictures from the Valley. Where did you post stuff online? Pretty much only on my website. From there it was word of mouth. And then picked up by bloggers, newspapers, magazines, etc. Do you put much energy into promoting your material online? Or are you more hands off? I’m hands off. I post events on Facebook, I have a mailing list, and that’s about it. But I do say yes to interviews. Did you enjoy teaching photography? The best of times, absolutely. I basically taught the kids (well, maybe not kids) one thing and that was to photograph what was interesting to them, what they were passionate about. It amazed me how often students told me they had never been asked to explore their interests. Good advice. And what kinds of things are interesting to kids these days? Were any of them in tune with a sense of dread? Well, I stopped teaching 4 years ago. Obama was still President then and I think we lived in sweeter times. Or at least lived with the belief that we might be able to solve our problems. But teaching others did kind of take the place of making work for myself. It's kinda funny. I have three kids. But I still struggle sometimes to figure out what motivates them or what they're truly interested in. One has gotten into photography. But "shoot what is interesting to you" might fall on deaf ears. He's still sorting it out. I think the camera is a great tool for exploring one's interests. When you tell someone to photograph what's of interest they start to find what is of interest to them. Super exciting process! It happens during the semester...maybe not with all, but with many. Dorothea Lange: The camera is a tool for learning to see without a camera. 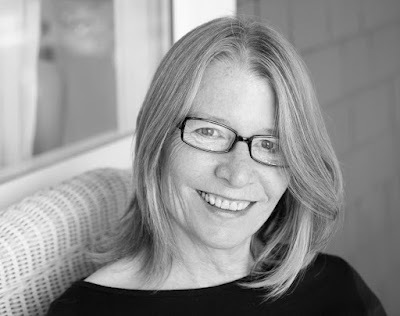 Mimi Plumb: The camera is a tool for learning your interests without a camera. I think one's interests lead to exciting engaging work, work that speaks to others. That engagement seems to give a person the wherewithal to make a lot of work, and explore a subject in-depth. I think the lesson might be aimed at contemporary photoland as well as beginning students. A lot of projects I see seem like a stretch. Meaning that the engagement isn't quite there? The personal interest. I see a lot of projects that don't tell me much about the photographer. They seem pulled at random from a list of ideas. Not that a photo has to do that. A photo doesn't really need to do anything. But I especially like the ones which feel personally invested. I like to read memoirs too. Maybe there's a connection. You studied with Larry Sultan. I saw him give a talk in Eugene once. Best photo lecture I ever attended. What sort of teacher was he? Larry was lovely, super bright, challenging in a thoughtful way. Always seemed to get to the heart of things. And he was very curious… what makes people tick? what's going on in the world? He’s sorely missed! How was your experience at SF Street Foto last June? I enjoyed giving a lecture about my work. It was a lively crowd of people, and I was pleased to see a lot of woman in the audience. Most of all, it was such a pleasure to meet and lecture with Jeff Mermelstein. I think his new iPhone pictures are brilliant. They’re street photos but he’s extremely close to his subjects, and the pictures are raw and edgy due to this intimacy. They sort of hurt to look at, from errant hairs to text messages, but they show something about life on the streets that I’ve never seen before. They get at what it looks like to be human, rather than what we might wish it to look like. 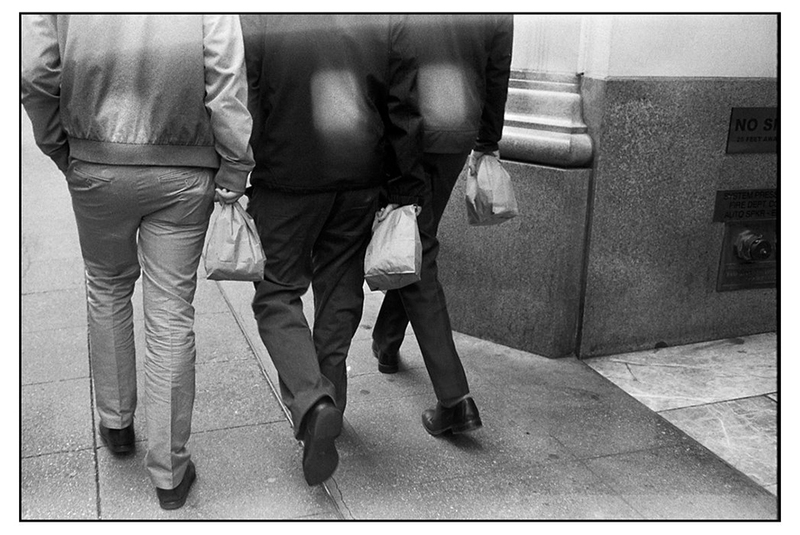 How do you think your work relates to street photography? I tend to be most interested in how people present themselves in public rather than in private. Consequently, a lot of the pictures I make are in public spaces. Two of my favorite photographers of all time are Winogrand and Arbus. 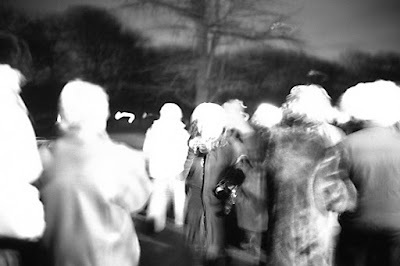 Few of my photos are made in the style of Winogrand in which people are unaware that they’ve been seen and photographed. My approach is more similar to Arbus’s approach. I make my presence known, and I often talk with the people I’m photographing. It’s how I feel most comfortable. Perhaps it would've been better to write you this letter in private. 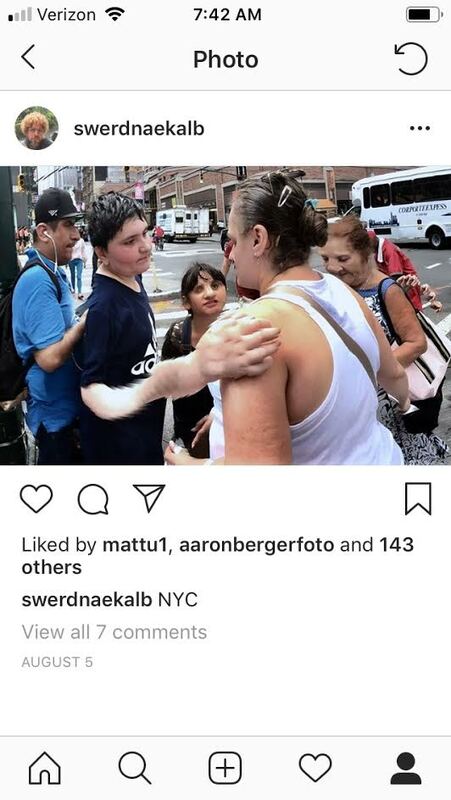 But your recent public statements regarding iN-PUBLiC and myself —in particular your interview with Blackkamera— have brought this dispute into the open, into the public streets, as it were. So I thought it would be best to respond in an open letter. Your statements have helped me understand some the motivations behind your actions, but I believe they misrepresent several key facts. What follows is a chronology from my perspective. I hope it will set the record straight for you and for all interested parties. The events below can be corroborated by any other member of iN-PUBLiC, who've all witnessed it first-hand from within the group. 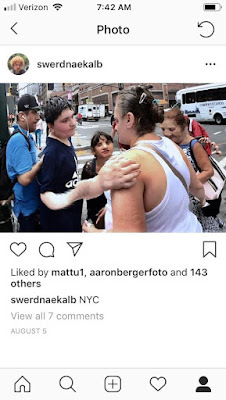 The photograph which kicked off this whole thing was my candid of a busy corner in Manhattan, shot with an iPhone in Pano mode. I posted this on my Instagram page in early August, shortly after taking it. Some viewers were curious about the process and I was open about my methods. I explained that I was experimenting with Pano in fluid situations. I was intrigued by the way the camera stitched together scenes, with glitches and normality mixed in happenstance. The possibilities excited me, and that entire week I posted similar iPhone Pano photos to Instagram. I don't expect you to show interest in my Instagram account or my photos generally. I'm merely providing context, to point out that the troublesome photo lived freely online for three weeks without causing much of a fuss. At month's end I submitted the photo for iN-PUBLiC's August Photo-Of-The-Month (POM) consideration. A majority of members voted. You were not one of them. In the Blackkamera interview you explained that "I was away for my son’s birthday during the vote and didn’t take part." Within the group your excuse was "I was too busy with teaching." Whatever the reason, there was ample time for everyone to contribute. The vote began in late August and lasted until September 3rd. Your decision not to vote was typical, as you have not voted in any POM selection in recent memory. I believe this was because you considered yourself above the fray. In your mind iN-PUBLiC was essentially a crew of underlings for you to manage, through which you could boost yourself by association. iN-PUBLiC founder: a notch in the belt. I am indebted to you for creating such a wonderful group, but its daily operations had long ago fallen below your pay grade. No need to dirty your hands in the messy mechanics, unless of course something went awry. Which in August it did. My photo received one vote more than the runner up, enough to win POM. I'm sure the irony of your decision not to vote was not lost on you. No need to rehash that. But questions did arise within the group about the photograph. After I more fully explained how it was made, you and Nils protested the photo's qualifications, calling it "computational" photography. In various threads then and since, you and Nils have maligned the photo with other labels: "composited", "computational", "digitally manipulated", "invented reality", "CGI", "compromised", and "computer generated". I was initially taken aback to hear my photo described this way. As I wrote to the group at the time, I considered the photo a valid expression of the moment, and its methodology quite benign. It was made on a public sidewalk, an unplanned glimpse of a fleeting scene, and it depicted exactly what the camera recorded. I did nothing post-exposure beyond cropping and slight color correction. Yes, the iPhone had stitched its own mistakes into the scene, but for me that was something to be treasured, not banished. Every camera sees the world in its own way, and that way is often different from what the eye sees. I believed at the time and continue to believe that dissonance to be very exciting. It is, on some level, the root of why I photograph. Of course people too see things each in their own way. For you the photo was computer generated, a close cousin to Peter Funch, and a threat to everything iN-PUBLiC had stood for over 18 years. You threatened to resign if it became POM: "If you post this POM the doors are open to any kind of photography from now on." 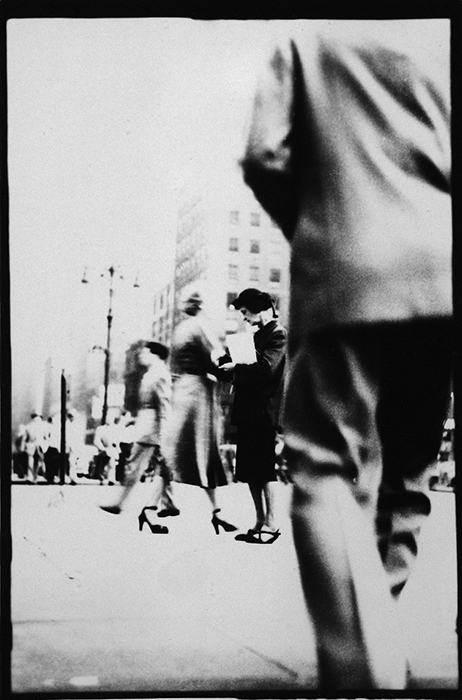 What followed was a computer generated discussion within the group about the photo, iN-PUBLiC's history and philosophy, and the way forward. For the next several days we were essentially at an impasse. Some of us wanted to respect the democratic process. You requested a revote. At one point I offered to withdraw the image for consideration for the sake of group unity. But no firm decision was reached for the next week. We were stymied, and I believe your ultimatum had a chilling effect on any course of action. Something had to give, and finally it did. On September 10th (the normal posting date is around the 1st or 2nd) the photo was finally published as POM by David Gibson. In your Blackamera interview you misrepresented this event as a premature curtailment of the discussion, as if undertaken furtively in the dead of night. In fact our deliberations had dragged into a stalemate by this point, and they had reached a critical juncture. Looking back on it now, David's action was probably the most reasonable way forward. But for you it was a tipping point, and your behavior became increasingly unhinged. After following through on your threat to resign, you floated the idea of a general vote among iN-PUBLiC members about "digitally manipulated" photography. If this vote did not turn out how you wanted, you threatened to "permanently archive" the site. Since you'd gone silent within the group, we had to learn about these developments second-hand via The Phoblographer. We were surprised to read there that you were "now deciding whether or now to take down the whole site," and that "the iN-PUBLiC project may have run its course." Translation: the iN-PUBLiC project may have defied your wishes. This was a scary moment for the group. But in the end nothing came of it because you never proceeded with that vote. I think you realized it was futile. The group's majority did not share your views, and we were in fact eager to put this entire episode behind us. Unfortunately that task soon became difficult, because your next step was to shut down our access to the iN-PUBLiC admin page and make yourself the sole gatekeeper. You made this decision unilaterally, without input from any other member. We found ourselves cut off from the site one morning with no communication or warning. In the Blackkamera interview you explained, "I suspended the site so we could have time to try and find a resolution and agree on some guidelines for the future". A less charitable interpretation is that you were desperate to exercise power over a group which had slipped from your grasp, from which you had in fact resigned. Fortunately we were able to salvage the Instagram account before you could seize that too. But on the primary site our work was preserved like bugs in amber. They were trapped like the colorful denizens of a night bus, your helpless plaything. Rumors flew on the discussion board. We wondered if this might be the permanent archiving we'd heard about. Would we ever regain access to our photos? Perhaps you were just flexing your muscle to remind us who was in charge? None of us knew for sure. We only knew we'd put a lot of work into a site whose future was in limbo. For me there was one more certainty. I resolved at that point never again to be in a collective with you. I believe you felt you'd drawn some line in the sand, and that others might take a principled stand with you. "If iN-PUBLiC doesn't stand for something, it stands for nothing!" The battle cry of an ancient horse-drawn army. The enemy you faced would be the dregs of iN-PUBLiC, hurtling toward an unmoored future of computer glitches and other blasphemy. On your side would stand proudly team canpubphoto. But as it turned out only you and Nils fell on your swords by resigning. To prove what point? It's still unclear to me. Friends who wouldn't resign were gladly thrown under the bus. "I am surprised and disappointed that photographers like Matt Stuart, Richard Bram, David Gibson and Jesse Marlow no longer valued the ethos with which iN-PUBLiC was first established," you told Blackkamera. On FB: "...a lot of the In-Public guys valued their membership of in-public over and above their personal integrity as photographers." In the same Blackkamera interview you falsely claimed that you and Nils were the only iN-PUBLiC members with professional journalism backgrounds, as if that were some measure of general integrity. This week you've launched yet another smear against one of Matt's photos, in a private FB group. Have you no shame, sir? I understand you don't like my photo. But must you attack the group's integrity? I can vouch for every member of iN-PUBLiC. We're ethical, talented, good hearted. 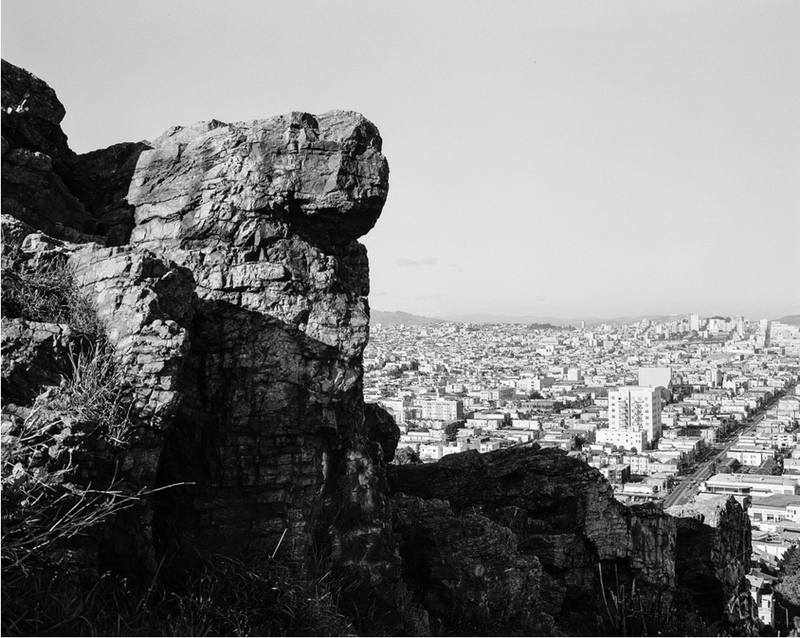 If you cast aspersions on our photographic honesty, that's your choice. But anyone who knows us and our photos will realize the absurdity of such a claim. Here we are a few weeks later. In your mind iN-PUBLiC's good name is permanently corrupted, its members doomed to the hellfires of CGI heresy. If photos like mine show up iN-PUBLiC in the future, "we as viewers will not know if they are straight photographs or not." Seriously? Is it that hard to tell? My photo has now been on the iN-PUBLiC site for a few weeks. Trust me, it has deceived no one. The world goes on, at least on one side of the battle line. IN-PUBLiC's turmoil is a tragedy, on that we can agree. But you've reserved special disdain for me. I've "caused all this trouble." I've deprived you of a source of revenue. I've muddied the canpubphoto waters. "It is the photographer's intention that matters," you write, with me firmly in the crosshairs, "Intention to document or intention to deceive." Nick, do you honestly believe I intend to deceive anyone with the POM photo? Do you think someone will look at my photo and mistake a seven-armed woman for reality? Might that same person also confuse an Ansel Adams monochrome photo for a world oddly bleached of color? To avoid confusion, let me clarify my intentions. I have been making photographs for roughly a quarter century, generally in candid unplanned situations. My methods are simple and I'm open about all of them. I generally prefer to hunt pictures in the wild, unposed. But if I preconceive an image I won't hide it. I may be curious how things look photographed, but I have no expectation of fidelity. And if my photos contain any intentional deception, it is through visual ambiguity, hard-earned by careful observation, not Photoshop trickery. "I am only against practices in street photography that shift the photographers intent away from creating a faithful record," you write. But what exactly is a faithful record? You've claimed at various times that flash photography is not faithful. That a photo with someone looking into the camera is not faithful. That hip shots are not faithful. That any interaction with the scene is not faithful. That the only true religion is to act as a fly on the wall, with no impact on anything. I consider this outlook ridiculous. 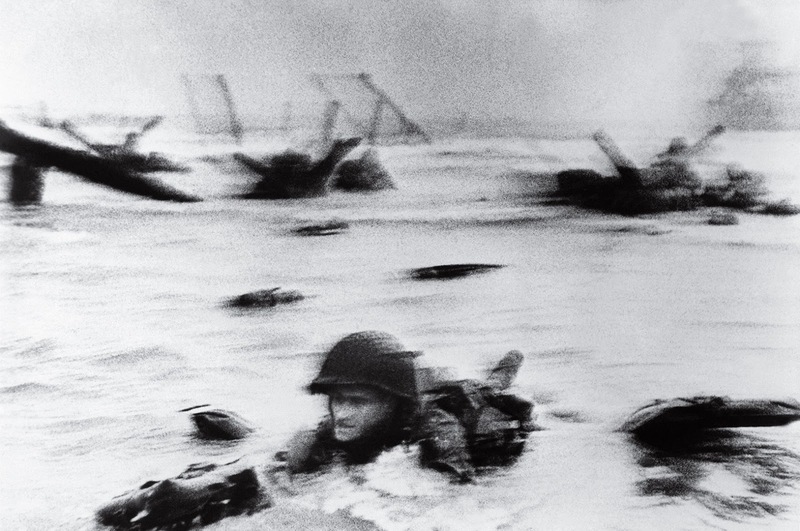 In the Blackkamera interview you cited Robert Capa's Falling Soldier photo as an example of a troublesome photo. Perhaps a better example for our situation would be Capa's D-Day photographs. They're distorted with motion blur, grain, and development stains. Does that invalidate the photos? Of course not. I believe the flaws —their unfaithfulness, if you will— make them stronger. But what do I know? I don't have a background in professional journalism. 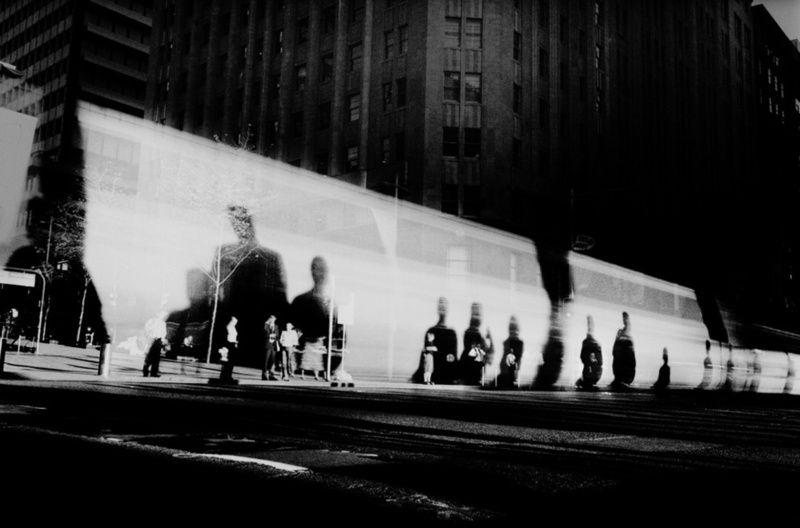 Here's a photo by Christophe Agou from iN-PUBLiC. Is this a faithful depiction of reality? 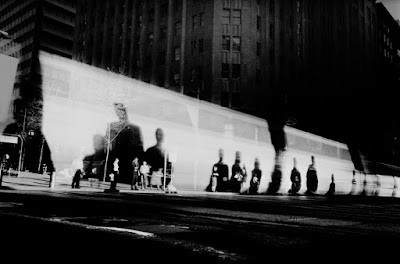 What about this one by Trent Parke? Or this one by Saul Leiter? What about my POM photo from March 2017, showing sprocket holes from misdevelopment? Or my portfolio of Instax photos, now retired from the iN-PUBLiC site, but which once showed several examples of Clayden effect reticulation? I don't recall any protest about these photographs appearing on the iN-PUBLiC site. But somehow my Pano shot crossed the line in the sand? Why? News flash: All photographs are translations of reality! All photographs mediate content. Faithful recording is a false standard. Instead of clinging to that one, I recommend a higher standard: Curiosity. I believe the central job of a photographer is to be curious. To wonder what's around the next corner, then wander into the next moment. What will this person do now? What will the photo be? What will happen if I shoot from here, or there? Or misexposed? 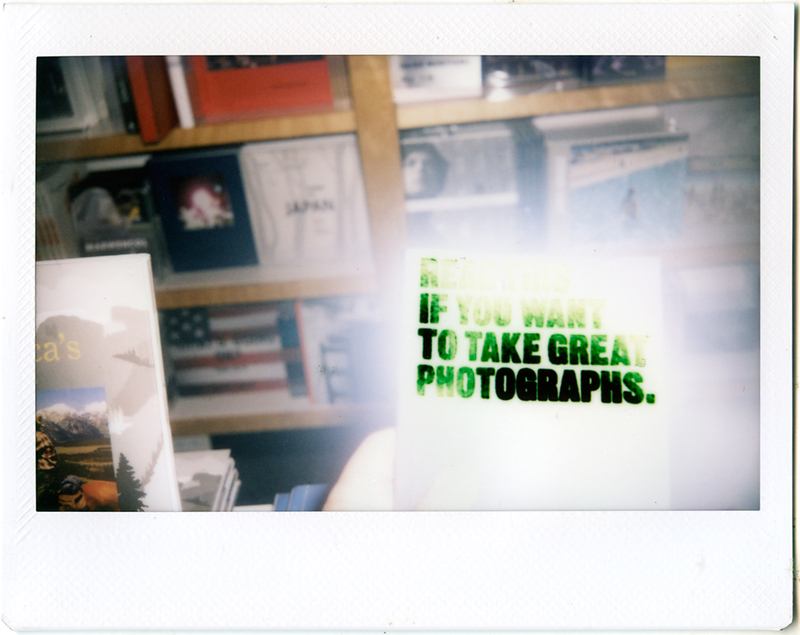 Or lightleaked? Or flawed? What about that weird iPhone Pano mode? What if it shows me a new way? Curiosity is the gold standard of photography. It is nearly impossible for a non-curious person to make good photographs. I hope that you are curious, Nick, but I'm not entirely convinced. I wonder how much you really enjoy walking and looking and being surprised. I can sense it in some of your photos, sometimes. But for many of them, no. They're the faint scratchings of someone trapped by rules, stuck in a small box of their own creation, cramming for a purity test. Pedestrians isolated on a bridge. Red doubledeckers. City walls lined up just so. Captions describing the artist at work, struggling to fit static scenes into this or that grand project: "You have to try things like this sometimes if we are going to expand our idea of street photography." True enough. But a fly on the wall is more expansive than this. A fly on the wall has more impact. I don't say all of this to be cruel or judgmental, but to point out to you that your rules have you in a straightjacket. I sincerely want you to experience the joy of escaping them. I encourage you to open up. Open yourself to other approaches. Let the rules go. Embrace mistakes. Wander. Wonder. Put curiosity above purity. Enjoy the simple act of observation on your own, no clients, no assignment, no project, no preconceptions, no payment plan. Skip and shout as you hit the shutter. If you meet the Buddha on the road, kill him. If you see the line in the sand, erase it. The good news is you are now free. No more iN-PUBLiC to anchor you. Don't worry about us, we're good. You're on your own. Fly. Possibilities beckon. The future's looking up!..